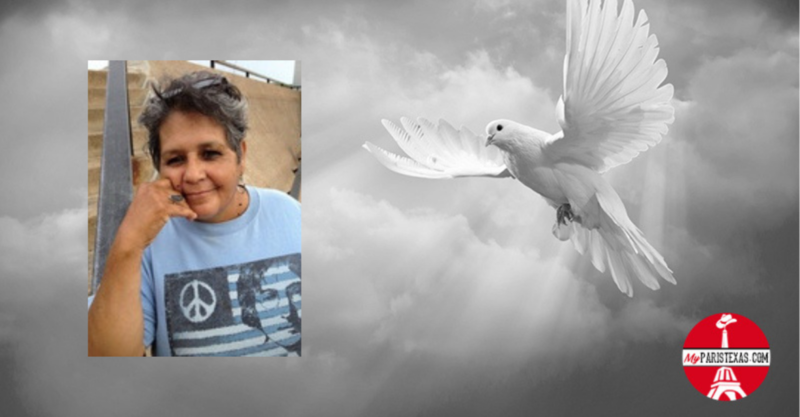 Irene Banda Leija, age 64, passed away on March 22, 2019. Irene was born in Knox City, TX on August 15th, 1954, to Inez Banda and Jose Leija. She loved cooking, music, dancing, and motorcycles. She worked as a Special Education Teachers Assistant at North Lamar High School for a number of years before retiring. She was a member of the Paris Biker Church and Oakhill Baptist Church. She was preceded in death by her siblings, Daniel Leija, Abel Leija, Jose Leija, Richard Leija, Alejandro Leija, Rosie Leija and Paula Leija. Irene is survived by her daughter, Autumn Aragon, son, Scott Wells, six grandchildren, Savannah, Arista, Draven, Willow, Gage, and Allen, and siblings, Mary Leija, Lorenzo Leija, and Juan Leija. Family directed memorial services to be held on Wednesday, March 27th, 2019 at 5:00 PM at The Saving Grace Ministries at 901 19th street NW Paris, TX. Donations will be accepted at the memorial service to cover cremation costs.